A lack of attention to prevention at home, no oversight or sunset clauses and an unreleased video all undermine the prime minister’s case. 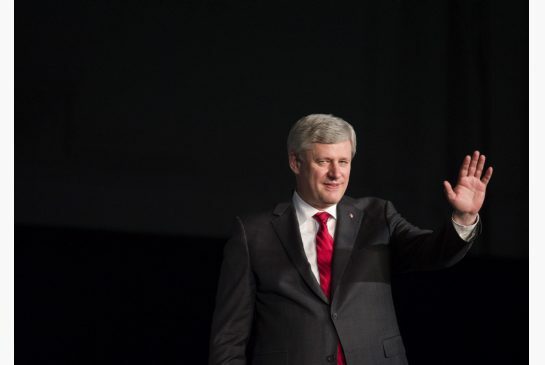 Prime Minister Stephen Harper waves to the crowd Sunday in Mississauga following an annual festival. Harper says he doesn't buy the argument that his new anti-terror legislation takes away civil liberties from Canadians. Stephen Harper, in word and deed, has told Canadians that his war on terror is a never-ending race between a government which will become ever more intrusive in the name of protecting the population and terrorists who will forever be searching for new means of evading detection. Bad things will still happen, the prime minister tells us, nothing is foolproof and nothing will drop a bubble of protection over the Canadian population. All of this may be true, but limiting himself to a view that things will be always thus in our “war” with jihadist extremism means Harper’s anti-terror law is strictly reactive, not proactive. This will likely be a political winner for the prime minister, but he chose to do nothing to reach out to those fearful of a step-by-step erosion of civil liberties, he chose not to take one simple step to make his case, he has decided to put his legislation in place in perpetuity and he has given short shrift to any effort to turn the tide against homegrown radicalization. Talk of dealing with root causes in our current political climate invites ridicule from the government, but Harper could have emphasized there were two prongs to his strategy. He chose not to. There is a program, under the watch of Public Safety Minister Steven Blaney, meant to combat radicalization roots at home and we are told that more money could be available for the program. But the government made no mention of that last Friday. It is providing training to law enforcement agencies to detect terrorist indicators and warnings and works on “tailored intervention” programs for those showing signs of radicalization. But, according to Blaney’s website, this group has not met since last June. As the Star has reported, Ottawa has committed about $5 million to “root cause” research on homegrown terror over the past three years, searching for answers to what makes people susceptible to recruitment into violent extremism, the “psychology of the Internet’’ and the domestic ramifications of our involvement in Iraq. The RCMP has also instituted a program known as Countering Violent Extremism (CVE) but the Conservatives have been coy about increased RCMP funding for such programs. In this realm, Harper’s Conservatives do not go as far as some allies, including the British who would require colleges and universities to implement anti-radicalization programs. But there are other notable omissions. Harper has chosen not to provide Parliamentary oversight of expanded CSIS powers laid out in the legislation and in so doing he has ignored similar programs from some of our closest allies, including the United Kingdom and the United States. Harper says he “doesn’t buy the argument” that every time you protect Canadians you take away civil liberties, a glib dismissal of oversight that he likens to so much opposition caterwauling. Similarly, Harper refused to sunset any of his provisions, which would allow them to expire in the years ahead so they could be debated in a future Parliament in a potentially changed security environment. Without sunset clauses, the potential for these laws to be in place in perpetuity soars. Finally, since Harper says this legislation a direct response to twin terror attacks which killed two Canadian soldiers last autumn, it would presumably help the government make its case if a so-called video manifesto by Ottawa lone-wolf killer Michael Zehaf-Bibeau was released as promised. We have been told the video confirms the Conservative conclusion that the Parliament attack was terrorism and that Zehaf-Bibeau makes specific reference to the Canadian military and foreign policy. RCMP commissioner Bob Paulson initially said the video would be released, then he backtracked, suggesting perhaps a transcript would suffice. We have neither and the RCMP says such release would endanger some unspecified investigation. Harper says he has never seen the video and the RCMP makes its own decisions. We shouldn’t have to take that on faith. Harper will want to bait the opposition into a debate on terrorism in which they can be painted as unwilling or unable to protect Canadians. The opposition should refuse to take that bait. But they do have the duty to push for more attention to prevention programs at home, sunsetting of legislation, proper oversight and the release of that video. Nothing in those arguments make them soft on terror. Harper has a cess pool of Domestic Terrorists being funded with Billions of Dollars of Federal and Ontario Provincial tax dollars. Ontario now spends Billions on it's fas.cist Criminal Cartel of Children's Aid Societies where lawyers like Marguerite Lewis of the Children's Aid Society of Ottawa personally fabricates evidence to abuse children and cause them harm far more damaging than child sexual abuse. Ontario funds professional Criminals Like Marguerite Lewis who have what is called "The Power of God". You see, they fabricate evidence blatantly in front of judges like the Dishonourble Tim Minnema, a former CAS lawyer who as a judge continues to Fabricate Evidence to assist the most violent of female abusers. Harper has a serious problem with largely corrupt Judiciary that now costs the Provincial and Federal Governments billions of dollars just to deal with the crime created by its own government funded Domestic Terrorists.